According to Shamai, the first century Jewish sage, Rosh Hodesh Shvat (the new month) is the New Year of Trees – of course, we go by Hillel’s opinion that says the 15th of the month. 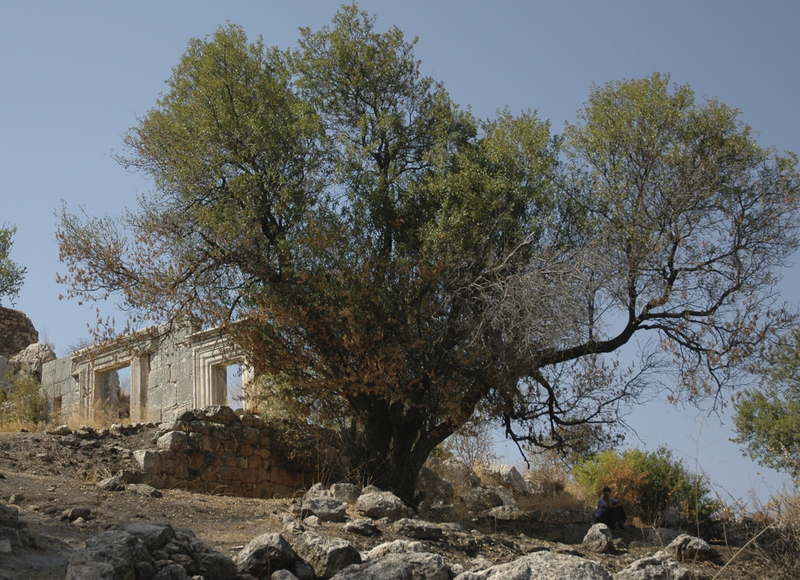 This photo shows the ruins of the 3rd century synagogue on Mount Meron with a tree in the foreground. Both Hillel and Shamai are buried at Meron. I chose this photo as an example of a new photographic exhibit I’m working on that is called “Wild and Sacred Places”. Many ruins and tombs, revered as holy sites, have a large, old tree growing nearby. Today I received an email from a German expat, Florian Seidel, living in Osaka, Japan who is into “urban exploration”, a term that I heard for the first time. With many abandoned or yet to be developed archaeological sites Israel would be a great place for urbex. For example, the synagogue in Meron was destroyed by the earthquake of 409CE. Coins were found at Meron from the Decapolis city at Sussita/Hippos that was destroyed in the Golan earthquake of 749CE and never rebuilt. Both are haikyo (廃墟 abandoned places) and fascinating to explore. The technical details – the photo was taken with a Nikon D70 digital SLR and 18-70mm lend in September (ISO 200, 31mm, F4 at 1/1600 sec). This entry was posted in Archaeology, Architecture, Photography and tagged Caesarea, Mount Meron, photo of week, Photography, Urban exploration, urbex on January 13, 2013 by Shmuel Browns.